Would Democrats reject a Republican's Supreme Court nominee in an election year? 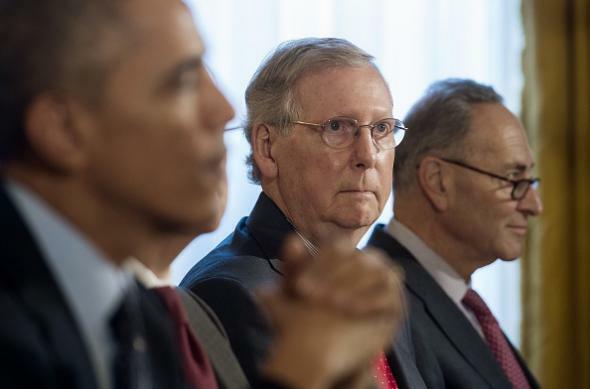 Barack “Barry” Obama with senators Mitch McConnell and Chuck Schumer at the White House on Nov. 7, 2014. In the days since Antonin Scalia’s death, majority leader Mitch McConnell and several other Republican senators have said that the president who’s elected in November—i.e. not Barack Obama—should appoint Scalia’s replacement on the Supreme Court. Though the GOPers have framed this position as deference to the will of the national electorate, the democracy rhetoric seems to many like cover for the purely partisan hope that the next president will be a Republican. What’s more, some observers have suggested, Democrats defending Obama’s right to make an appointment have no higher principle in mind than their own partisan interest—and might be saying the same things as McConnell et. al if the shoe were on the other foot. Is that true? If the dynamics of the situation were reversed, would Democrats be going so far as to say—as McConnell and other Republicans have—that the Senate shouldn’t even consider the president’s choice for approval? Let’s consider both sides of the argument. Barack Obama, John Kerry, and a number of other Democratic senators filibustered Samuel Alito in 2006. Obama was among 23 Democratic senators who joined Kerry in voting to filibuster Alito—an effort that Kerry led remotely because he, in classic cartoon-patrician John Kerry fashion, was in Switzerland at the time. This group of Dems’ stated objection, though, was Alito’s extremism, not the mere fact of his nomination. Democrats are politicians and politicians all do things they claim they would never do. Kind of a vague point, I know. But it’s true! Not even all Republicans currently agree with the position that McConnell and his backers have taken. Judiciary Committee chair Chuck Grassley and North Carolina senator Thom Tillis are among the GOP figures who have said that Republicans should at least consider an Obama nominee. Democratic senators have less incentive to take a hard line because they’re less likely than Republican senators to be challenged by a more ideologically extreme primary opponent. Five of the 10 Republican senators running for reelection in 2014 were opposed by in-party challengers who got 35 percent or more of the primary vote. None of the 15 Democrats who ran for reelection faced challengers who got even close to 35 percent. Republicans who compromise with a Democratic president take considerable heat from within their party. That hasn’t been true of Democrats. Related: Democrats tend to move toward the center when they think the prevailing political winds are blowing against them. From the Iraq War to the decision not to include a “public option” in the Affordable Care Act, Democrats have generally been less willing than Republicans in recent years to take stubborn and/or broadly unpopular positions. As it happens, the GOP’s singular extremism is a phenomenon that’s been well-documented by wonk king Norm Ornstein, who told Slate’s Isaac Chotiner this week that the Republicans’ treatment of Obama judicial nominees has been more obstructive than the Democrats’ treatment of George W. Bush nominees was. Of course, this question is ultimately hypothetical; you can’t prove what would happen in our alternate shoe-on-other-foot universe either way. But as you can probably tell, my subjective judgment, given the above, is that even if they wanted to leave a vacancy on the Court for a whole year under a Republican president, Democrats would eventually fold and at least consider a conservative nominee. *Correction, Feb. 18, 2016: This sentence originally misstated that Republicans controlled the Senate in 2011 and 2013. **Correction, Feb. 23, 2016: This sentence originally misstated that Stevens et. al were all nominated less than a year before a presidential election, but that’s only true of Kennedy; in fact what the four justices have in common is that they were confirmed less than a year before an election.